Bella makes your heart ache in the best way. I first saw Bella play in my own living room. It was around a year and a half ago, and I was throwing a show at the cozy blue house I live in with 13 other students in a tiny Vermont town, just a few minutes’ walk from my college campus. The night was cool but the leaves hadn’t quite fallen yet. We moved all the furniture to the sides of the room and I laid Christmas lights down in the middle of the floor, below the surrounding gaping bay windows. Friends from school played first and then came Bella, leaving everyone silent, in awe, and smiling. I’ve booked Bella to come play at my school every semester since and every time I want to cry lil’ tears of joy. It makes my heart ache in the best way. 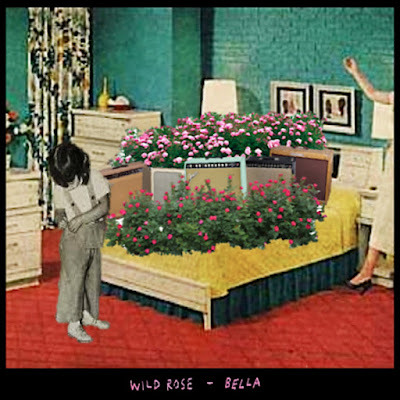 Wild Rose is a synthesis and deepening of an already developed sound. The songs on this album are bare - just vocals, guitar, and some keyboard - but are never lacking. The first single, “Dancing Bruise," comes in blazing. There is something almost sultry about it, like a letter addressed by an anonymous sender. Bella begins, "Everybody sees you / Dreaming / You are always skipping / While you’re bleeding." It’s a free-for-all of a song, a carnival; something reckless and surprising but strangely familiar and comforting. I taste cotton candy before a roller coaster, feel the sweat of a hot summer night. I want to dance to this. “A Passing Time” is a slow burner on the album, something measured and soft. The last verse ends, "I wanna be the acid wall / To clear it all / It’s a passing time." It sounds like the ocean right after sunset during gloaming hour. The beach is a solid metaphor for time; there are the tides marking the day’s passing, the night’s descent, there is sand in the hourglass. I picture a message in a bottle rolling up onto the shore and a sandcastle slowly melting away. When a relationship ends, whether or not you stay in that person’s life, there’s this moment when you realize that no matter what, a time has passed. Time always passes and things change. Experiences become memories, and understanding that can be heartbreaking or beautiful but usually both. There’s an edge to this song like all of Bella’s, but it's wrapped in something wonderful and sentimental, like a worn down baby blanket. A good lyricist lets the abstract become specific on its own. Bella’s lyrics are astounding in their simplicity and, in turn, the complexity they’re able to convey - the way in which you want to say “mine.” They create characters that live as if inside a picture book, with sweet names and simple actions. Bella sings on “lucy, bessie,” “Lucy’s in the kitchen / I can hear her singing / Bessie’s by the faucet / waiting for a drop.” Lucy and Bessie could be anyone, but on the other side of the same coin, the listener is roped into a shocking sort of intimacy, as these names become facets and mirrors of our own personalities, of people in our lives. Reading the lyrics written down on paper, they have their own power even without the accompanying music. Bella works with soft images, metaphors hidden in written landscapes that turn into vast scenes of sound. Bella’s music never fails to give me a feeling that I’m just at the cusp of something, hovering over it, feeling it but never quite touching it. This is music that reminds me of people I know and love and miss. When I listen it feels like I’m being hugged by ghosts, a sensation that reminds me of childhood. Childhood is a profoundly lonely experience, at least as an only child, which is how it was for me. There’s a specific kind of loneliness when you're young, differing from its later iterations in the way that you don’t have words for it, or understand what it means or could mean. The shapelessness of the future as it looks from a child’s eyes is wonderful in a way, like some unknown island in the distance, or a mountain range peeking out through the tops of trees. There's possibility and there's some kind of freedom. I feel myself back in the woods that I once ran through on weekend trips out of Los Angeles, where I grew up, to find myself utterly alone on a floor of dry leaves surrounded by wisps of wind straining to pull them up and the small chirps of birds far above me, reverberating through summer air. I seek out music that makes me feel profoundly lonely, that can bring me back to a place of shapelessness and possibility. My favorite musical experience is part reflection and part time travel, and Bella’s tunes are generous with providing both. Listen to Bella on bandcamp.